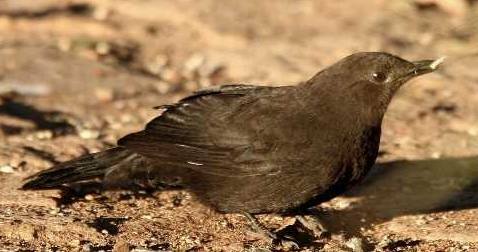 For a few years, there have been various suggestions that Boulder Chat might indeed be a legitimate species on the South African List. The species is generally regarded as a Zimbabwean near endemic, with small populations around granite domes in eastern Botswana, Zambia and Malawi. John Isom (veteran birder, and author of "Go Birding in the Transvaal") saw a Boulder Chat flying over the Limpopo river at the junction with the Shashe a few years ago. In 2005, Gisela Ortner of the Wits Bird Club reported two Boulder Chats in Mapungubwe National Park - on the steep rocky sections between Leokwe Camp and the Limpopo Forest Boardwalk. Then in May 2006, Sarah Venter of the Limpopo Birding Route, got word of a "resident" Boulder Chat at mMabolela on the Limpopo river west of Alldays. The QDS square where this bird was recorded is 2228CA. On Sunday 14 May, Sarah drove up to mMabolela and photographed the bird. This locality is quite far west (and south) of Mapungubwe National Park, but actually not that far from where the birds have been recorded in Botswana. According to Sarah, the bird had been around for more than a month. It has been seen around the farm house and sheds every morning and evening by the owners, Mark and Lesley Berry. mMabolela, has some small granitic outcrops in the area, but none close to the farm where the bird has been present for at least a few months. According to Roberts VII the habitat of Boulder chat is as follows: "Confined to well-wooded granite batholiths, hills and rock outcrops where these have eroded to boulders on the slopes and scree slopes at base. Occupies isolated granite hills <0.5 ha provided they are wooded, regardless of rainfall." It seems likely that the birds reported from Mapungubwe, which is mainly heavily eroded sandstone, are just passing through, as this species clearly has very specialised habitat requirements, and is reported to abandon granite domes if the vegetation gets too thick, or if alien Cherry-pie (Lantana camara) bushes invade the territorial area of the birds. mMabolela is part of the Soutpansberg-Limpopo Birding Route and is situated on the Limpopo River west of Alldays, close to Swartwater (near the Zanzibar Border Post). Mmabolela has two lovely big farm houses, one of which sleeps 14 people. Both farmhouses are fully equiped for self-catering and are highly recommended for a birding stop-over. The riverine vegetation along the Limpopo River is in excellent condition. Dewald Swanepoel, who visited the area on 28 May reports species such as Bataleur, Swallow-tailed Bee-eater, Tropical Boubou, White-crowned Lapwing, Meve's Starling and Shaft-tailed and Long-tailed Paradise Whydah in full breeding plumage. Clive Kaplan and Phil Penlington were also there, and took the images shown above (Click here for more photos of the Boulder Chat). To contact mMabolela, cal Mark Berry on: 014 - 767 1187 or 082 872 4397 or email him on mark@mmabolela.co.za You can also visit their website: www.mmabolela.co.za. If you have a copy of the new Greater Limpopo Birding Routes guide, mMabolela is on pg 39.